In the Enduring Flame Trilogy, Mercedes Lackey and James Mallory have given audiences a new view of the complex and fascinating world they originally created for the Obsidian Trilogy. Jumping ahead one thousand years in time, Lackey and Mallory have told the compelling story of Harrier Gillain, the first Knight-Mage in a thousand years; Tiercel Rolfort, the first High Mage in hundreds of years; and Shaiara, the young leader of a desert tribe who takes both boys under her wing but has a special affection for Harrier. These three young people are their world's main defense against the evil called up by the rogue Wild Mage Bisochim. Bisochim's conviction that he was restoring the balance was shattered the moment Ahairan took her first breath. 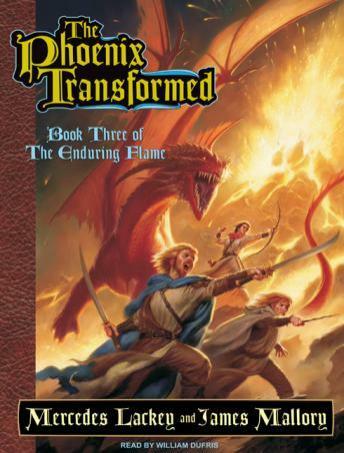 Now, in The Phoenix Transformed, Bisochim joins forces with Harrier and Tiercel, and the three mages search desperately for a way to destroy Ahairan as she sends her magical forces against them and the desert nomads under their protection.